Cylinder pulls are used to pull the front door closed from the outside. This product is very useful when there is no centre door knob or door handle. 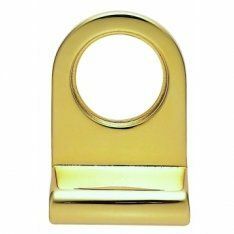 At Ironmongery Experts we supply a wide variety of door cylinder pulls to meet your requirements, from antique-looking and unique hand forged cylinder pulls by From the Anvil to more modern choices, including one of our stainless steel cylinder pull and polished brass architectural cylinder pull. For entrance door security, we stock a large variety of door locks. Sash locks are the ideal locks for entrance doors – by incorporating both a latch and deadbolt feature this type of locking mechanism provides the added security. Mortice deadlocks are normally used as a secondary lock for entrance doors as these are simply operated by a thumbturn or a key. Nightlatches can also be used as a secondary locking mechanism – these door locks are operated by a key from the outside and by a knob or thumbturn from the inside. For further security are also supply a variety of door chains and door peephole viewers. To provide people outside your home or office with the possibility to alert you of their presence, you can choose from our selection of bell pushes and door knockers. Door knockers can also be a statement piece for your front door to show off your style and can represent the type of person you are. For embellishing your entrance door any further, we’d recommend having a browse through our range of door letter plates and door numerals.